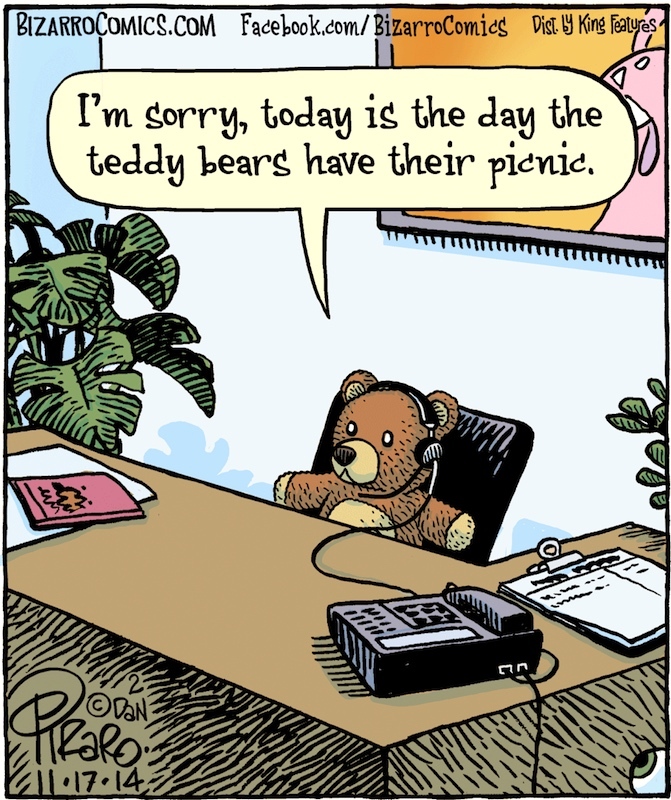 I was moved to declare November 17th Teddy Bear Picnic Day, in honor of Anneli and her husband Peter, but it turns out that (by whatever obscure mechanism these things happen) July 10th is already taken for this occasion, according to the Days of the Year site. 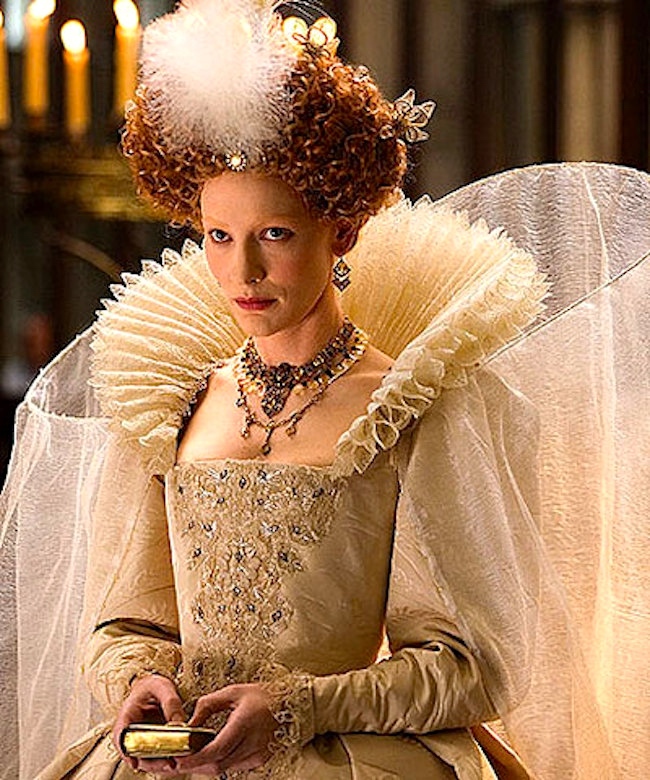 I’m Elizabeth the First / Say it if you durst / I’m a hell of a queen! On my iTunes, there’s “The Teddy Bears’ Picnic” (I have three versions on my iTunes), which is older than you might think, with a melody from 1907 and words [by Irish songwriter Jimmy Kennedy] from 1932. The song is framed as something for grownups to sing to children. It tells of a secret world, hidden from the world of everyday life, where all the bears can frolic together as they will. Songs that grownups sing to kids are almost always as much for the grownups as for the kids. In this case, the idea of a secret world is naturally attractive to children, and figures in children’s literature of all sorts. But it’s also attractive to adults, especially those with tainted identities (for whom the secret world might provide an escape from the burden of their identities). In the real world, actual picnics (or their equivalents) have provided such worlds outside of the world, places for private carnival. San Francisco’s Bohemian Grove and similar playgrounds for the elite, for instance. Meanwhile, for some years the Columbus OH gay bar Kismet (for a long time in the shadows, like all gay bars, and now gone) had a summer picnic (closed to outsiders) in a park west of Columbus. No doubt there were similar events in other cities back in the day. And eventually there were large regional and national private gay carnival events, the circuit parties; see my 6/22/10 posting “Rivers of Babylon”, with a section on circuit parties. Our picnics beneath the trees where nobody sees. It’s tea time at the Natural Food Kafe and in front of you is literally picnic hampers, a car chequer blanket, and teddy bears. Although this is about an all-together different type of bear! The gay male bear! Eden [Ballantyne]’s storytelling flows light and easy on a sunny afternoon in a balmy cafe basement. His biography is hilariously enacted as a puppet show using teddy bears to portray the many character bears we encounter. As he explains, one day he stopped waxing, watched his tummy protrude over his waist belt, and realised he’d become a bear. Throughout his life, bears have come and bears have gone, all leaving their paw prints on his heart and emotions. A little nostalgia, a lot of laughs, and a few absurd situations. As far as I can tell, all the human characters were naked guys, bearish in one way or another. Naked men, explicit sexual themes, not recommended for under-18s. But obviously sweet, as it should be, if it’s going to riff on this song. This entry was posted on November 17, 2018 at 6:44 pm and is filed under Gender and sexuality, Holidays, Homosexuality, Linguistics in the comics, Movies and tv, Music, My life, Understanding comics. You can follow any responses to this entry through the RSS 2.0 feed. You can leave a response, or trackback from your own site. I got this record around 1950, when I was around 11, and loved it, though I found it perhaps a little cloying – I can still sing it through, though. I got a 28 inch tall teddy bear, possibly Gund, for Christmas when I was 2 1/2 in 1941. White Puss was my alter ego through my childhood, and he sits on my night table in my 80th year. I’m awfully straight, and I confess the gay connection eludes me, but it doesn’t bother me in the slightest. I yam who I yam.